Blue Fin tuna slowing down.King Mackeral fishing doing good on Gulf Stream trips.Been catching alot of Black Sea bass and Sharks inshore on 1/2 day trip last couple weekends. Had a tough trip today inshore. The water has gotten really cold over the last few days close to the beach. 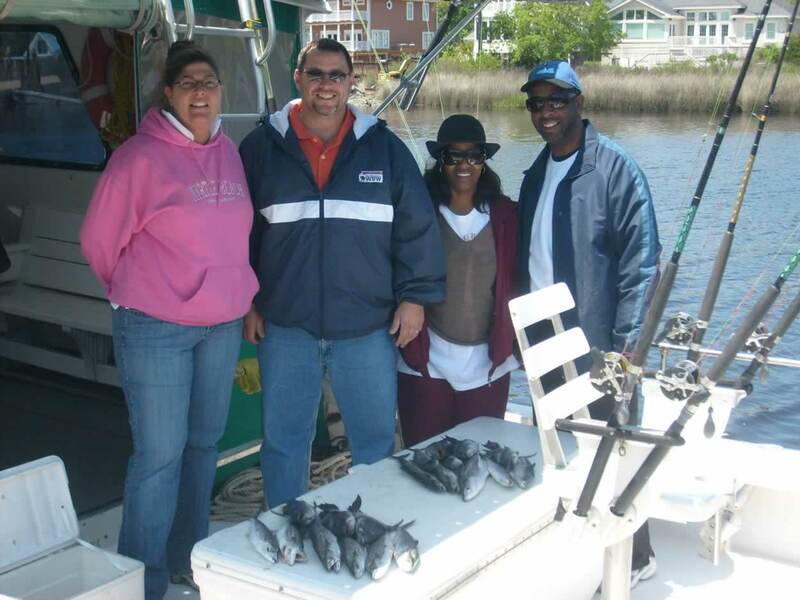 We had to move offshore to be able to put some fish in the boat. 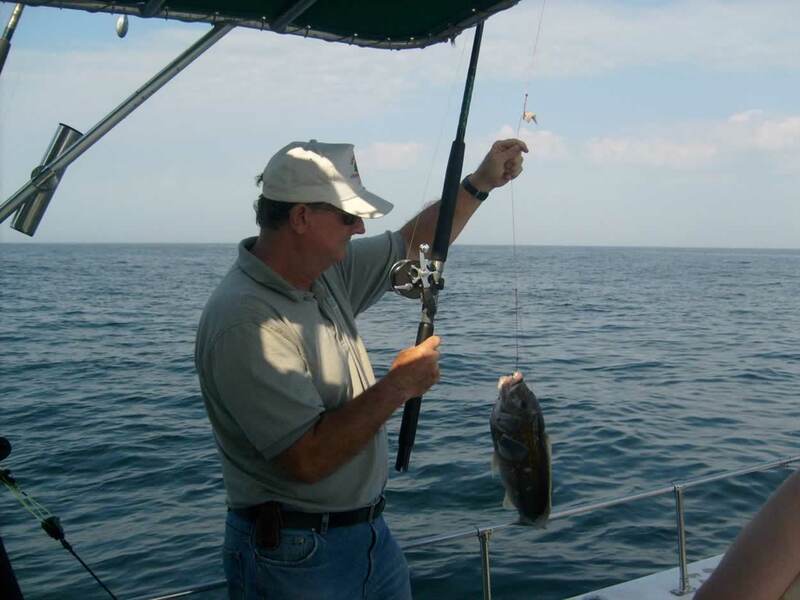 The spiny dogfish ate us up wherever we went, but we managed to catch some black bass and other fish offshore. 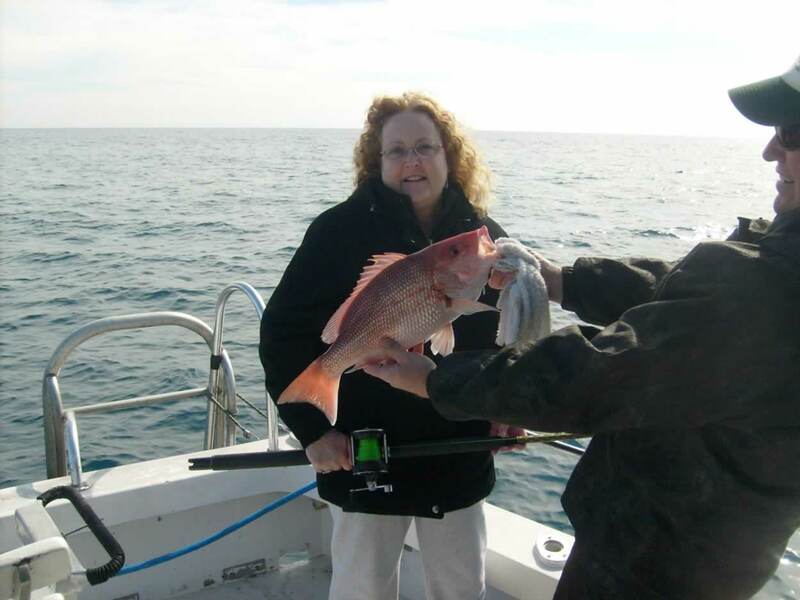 Marie from Atlanta, GA, caught one nice, genuine red snapper. 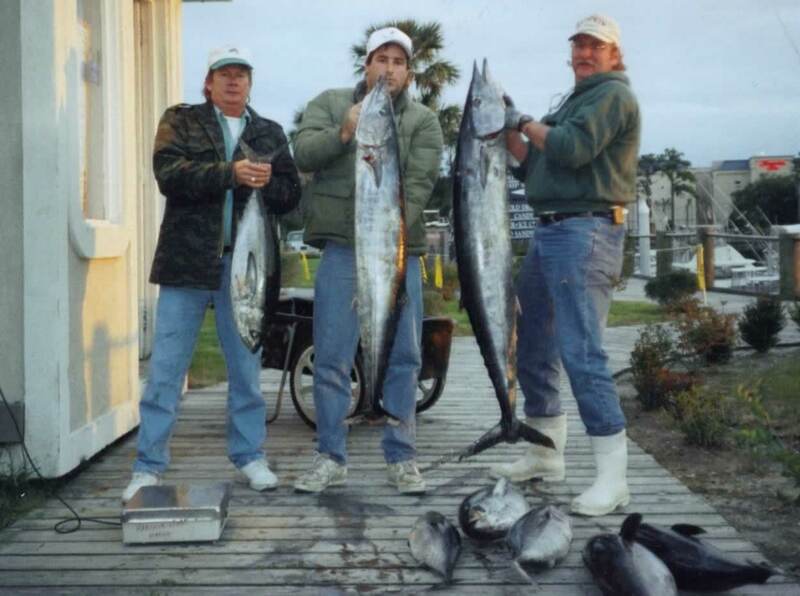 Nice Wahoo and Blackfin tuna showing up in Gulf Stream.Wont be but a couple more weeks and the yellow fin tuna should start showing up. Inshore trip today alot of sharks and a few black bass from stop to stop.Last one turned out to be the hornet nest. 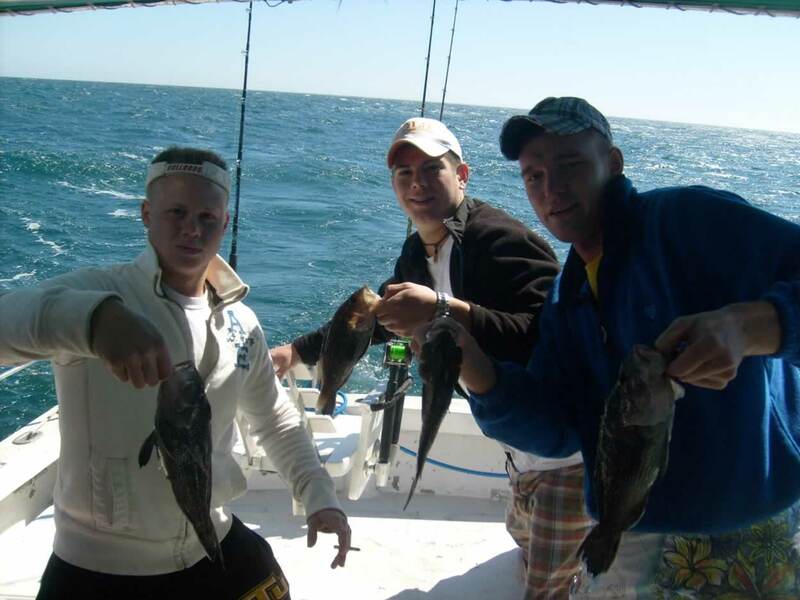 Doing some 1/2 day trips this week catching good Black Sea Bass and lots of sharks. Over the past week, I've done a lot of half day trips. 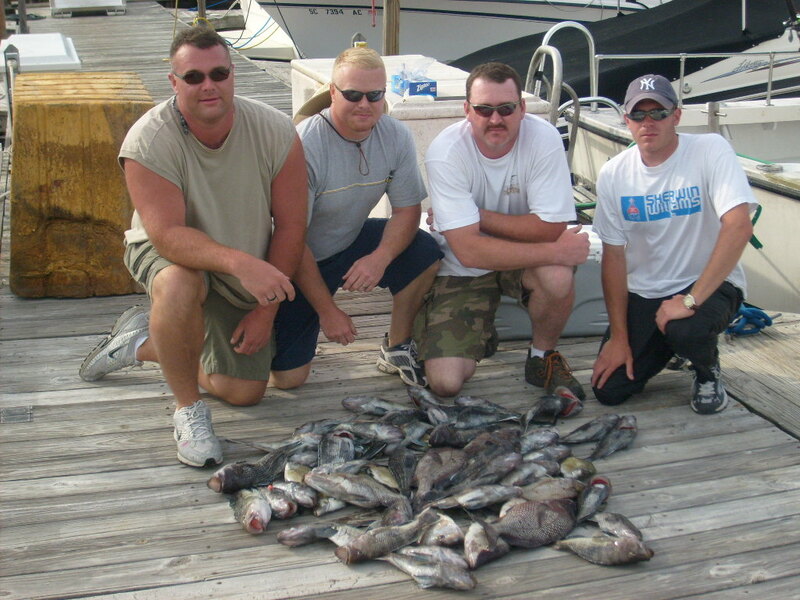 We had a lot of catches of black sea bass inshore 4-8 miles out. 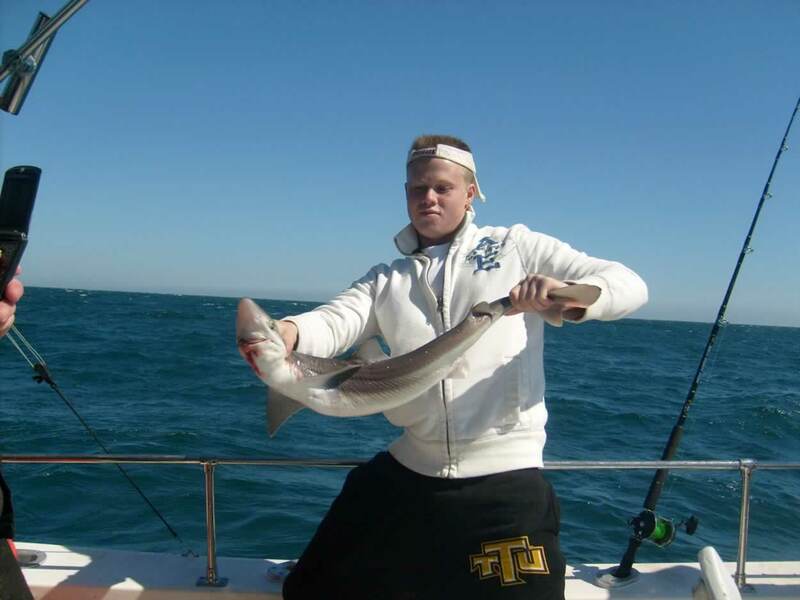 Here's a good picture of a rare fish in our waters this time of year. 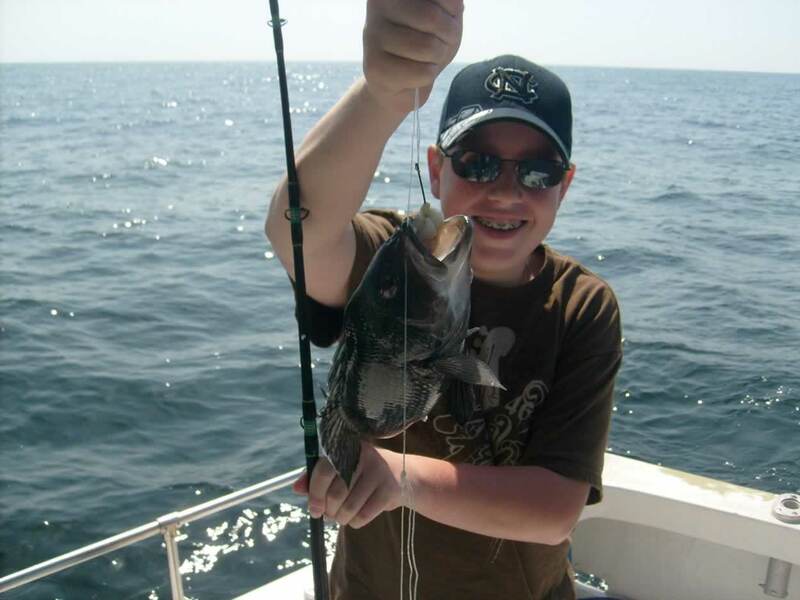 It comes from up in the north Atlantic - a tautog, or what we call slimy rocks. It lives along the bottom, in and amongst rocks, wrecks, mussel beds, bridge pilings or other bottom features, but we very seldom catch these down here. 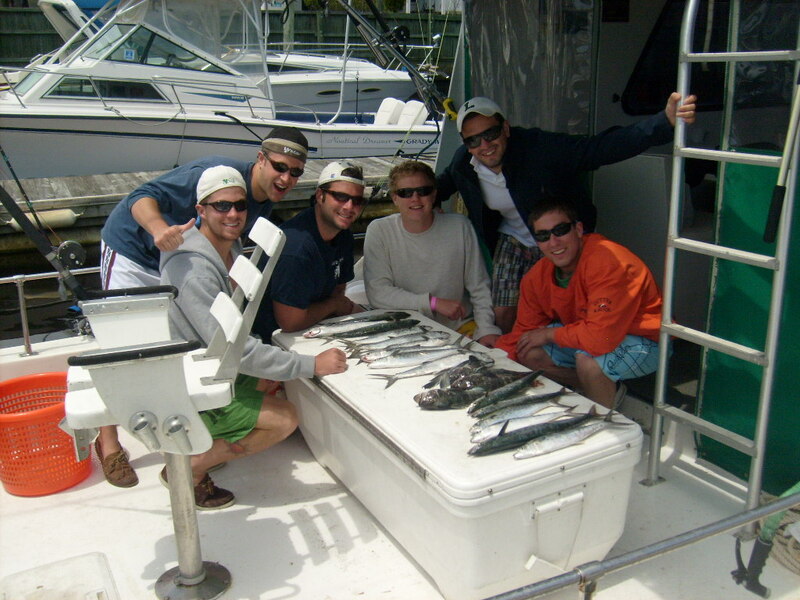 Got some gulfstream charters coming up Easter week. I can't wait to get out there and see what the tuna and wahoo will be doing. They have slowed down the last couple of days from other boats because the water is too cold. That should change at the end of the week. 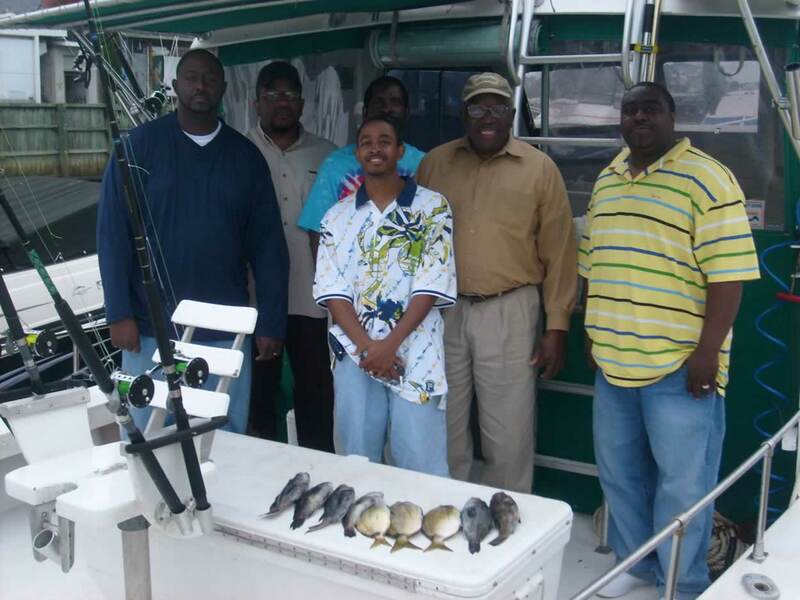 A group of men from a church group were down and wanted to do some fishing. 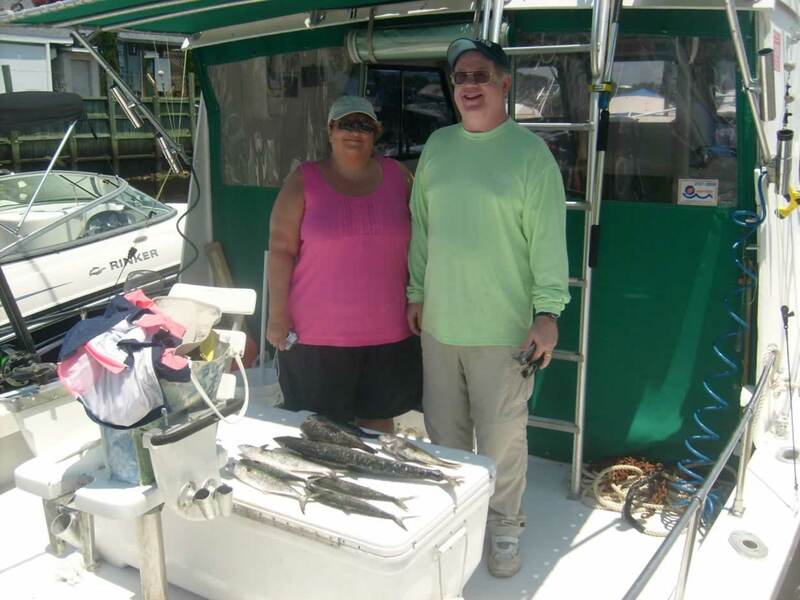 We did an afternoon trip fishing about 5-8 miles out. There are a lot of sea bass on the beach right now. 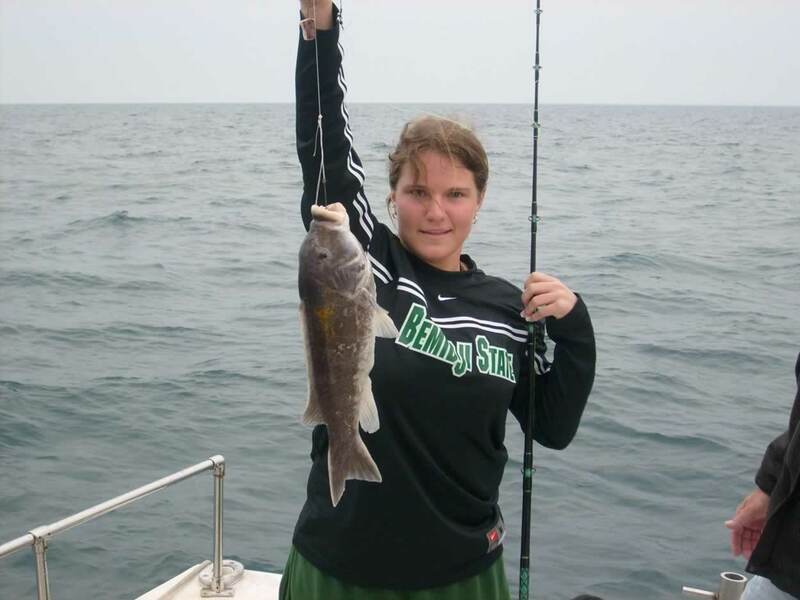 Most fish average from 10-11 inches. 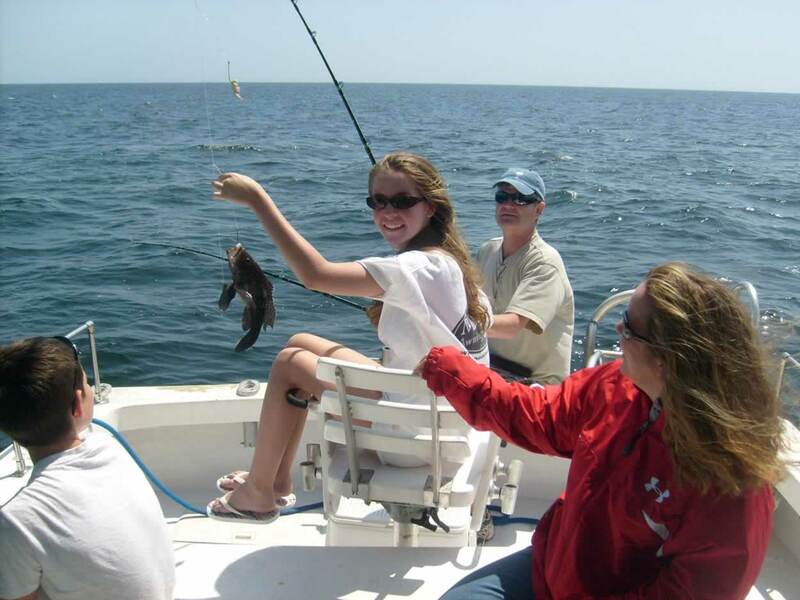 We caught fish non-stop but due to the new law with black bass at 12 in., we didn't get to take many home. I had a group of college students today on a 1/2 day trip. 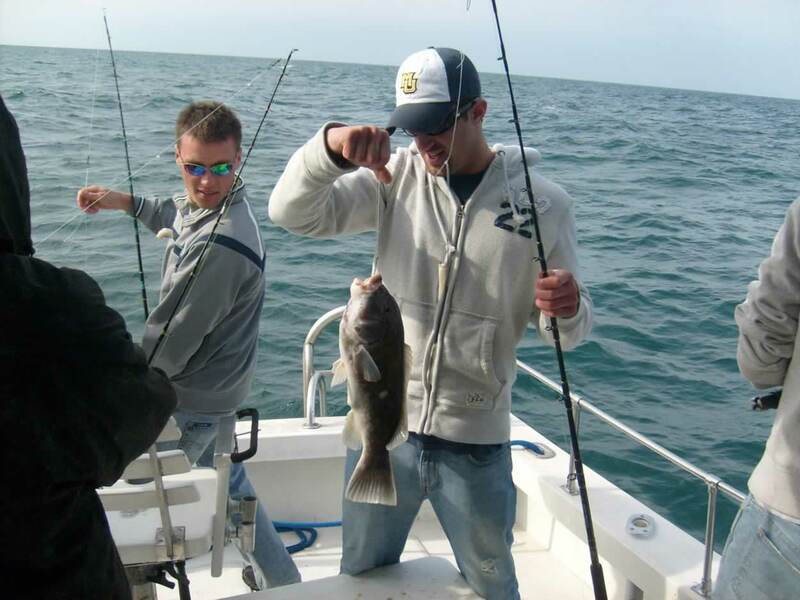 We caught plenty of black sea bass and had one nice surprise like last week, another tautog. On my afternoon trip, I had a family from Wisconsin. The black bass were still chewing hard, but it was hard to get them over 12 in. We ended up with a nice family fish fry amount anyway. 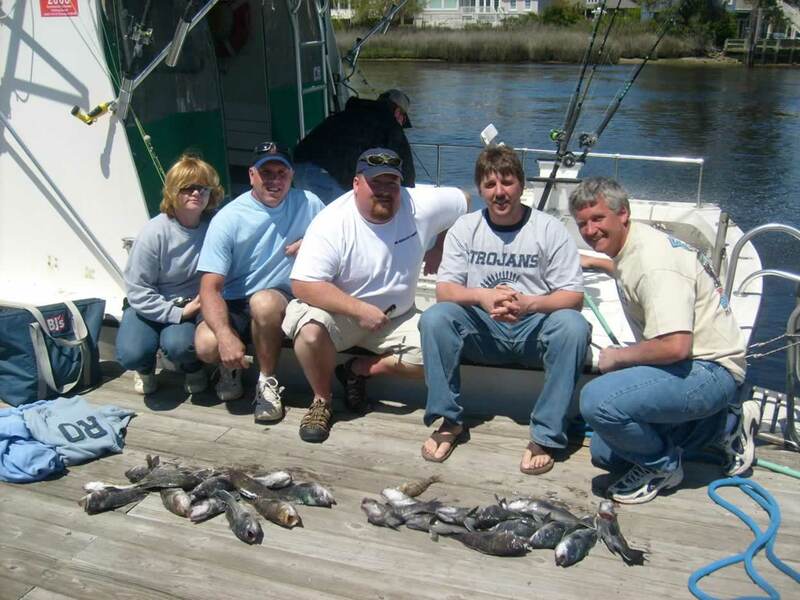 The bacon family and friends had a good catch today out on the water. The wind has been blowing the last couple of days and I haven't done any fishing. I've been working on a new 42'Fish Hook II boat. 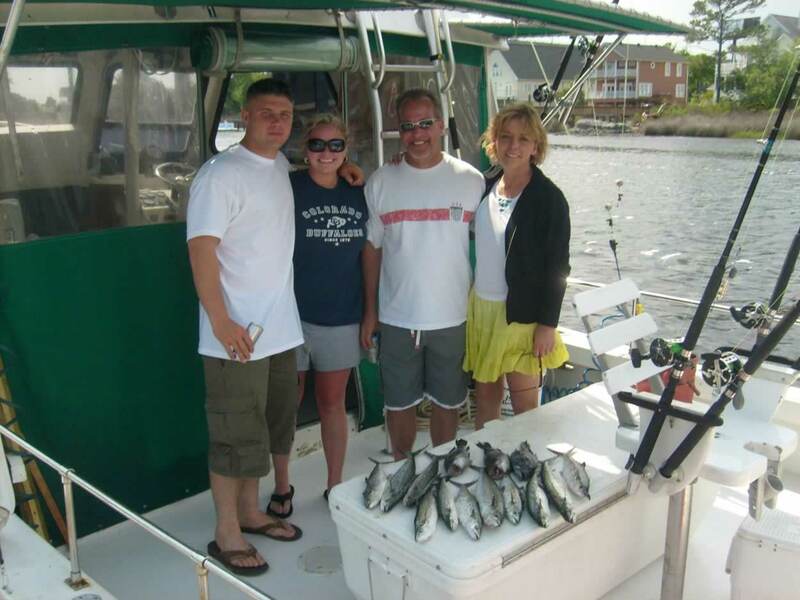 This boat is a battle tank that will be really comfortable platform for charter fishing. It will have air conditioning, heat, and a brand new power plant. You won't want to get off this boat at the end of the day. 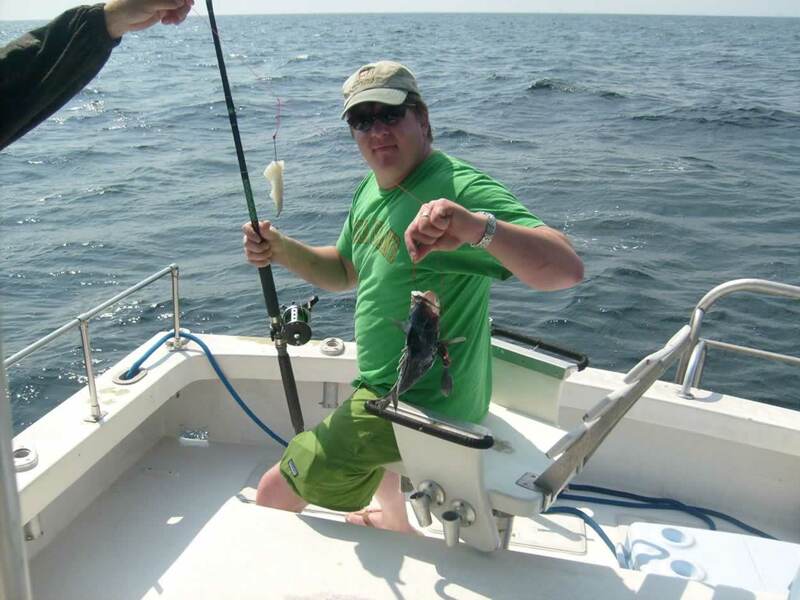 Good catches of black bass today on half-day trip. 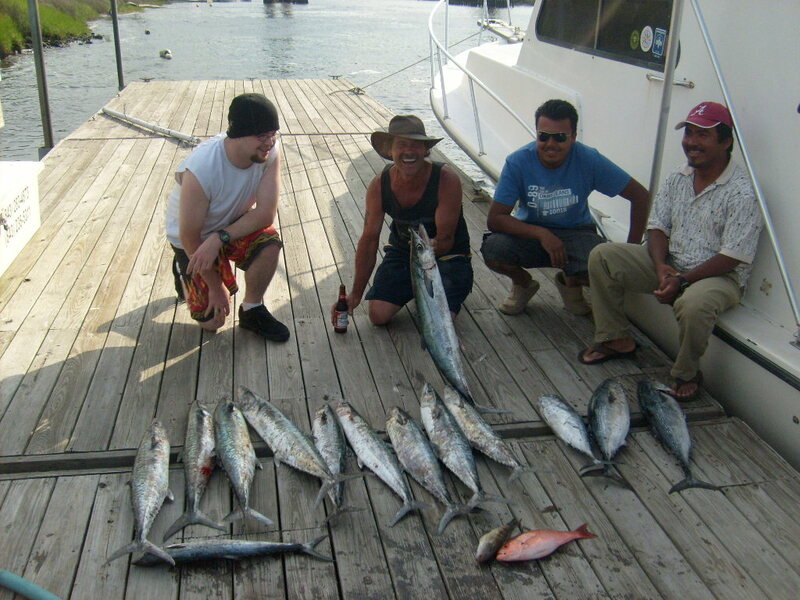 Had a group trip and did really well with the bottom fishing. 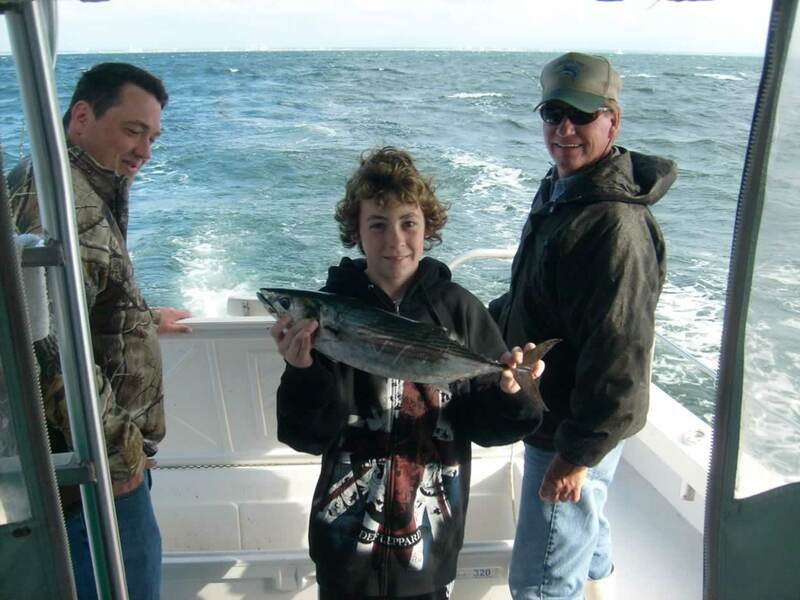 This young angler Andrew had alot of fun today with his father,and friend Charles. 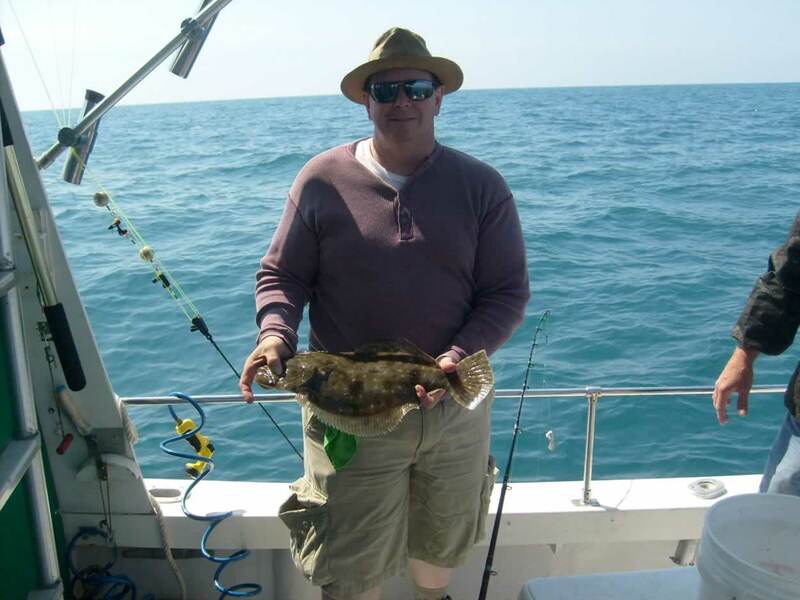 Nice flounder showing up on rocks offshore. 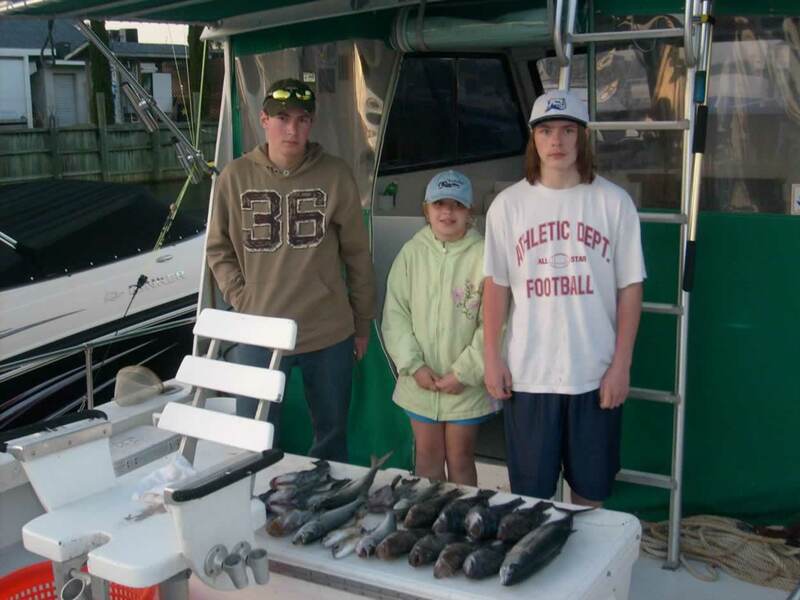 Found some some little tuna this morning and some Blue fish. 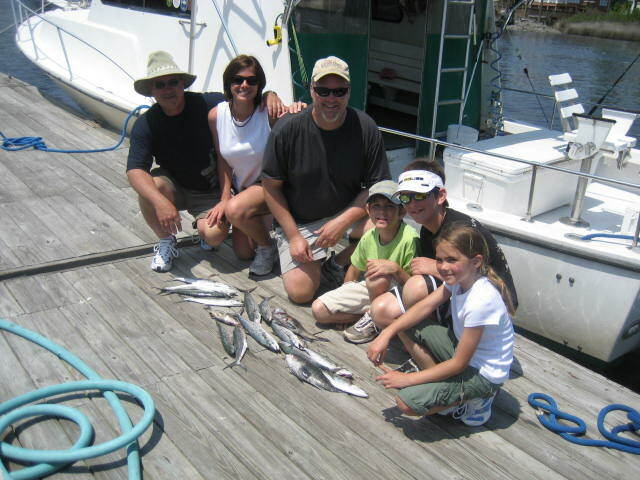 Afternoon trip - This family from New York had a great time winding in some bottom fish on a beautiful weather day. 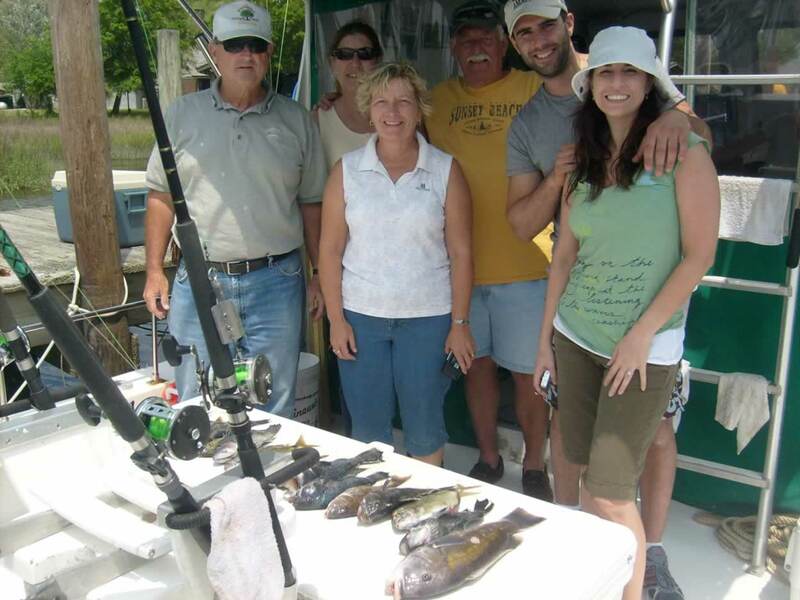 Good catch of bottom fishing this mornig with family from sunset beach. Afternoon trip keeper not a keeper? caught some more Black Bass inshore this afternoon. Spanish Mackeral in full swing today all you wount to catch. I had a group trip this morning with people from Atlanta, GA, and newlyweds from New York, NY. We started out trolling and caught plenty of spanish mackeral and then went to the bottom to finish off with some black bass. The fish were biting good today. I can't wait to go the the gulfstream next week. I have 4 trips so hopefully the weather will stay nice! Big day with the spanish mackeral this morning. 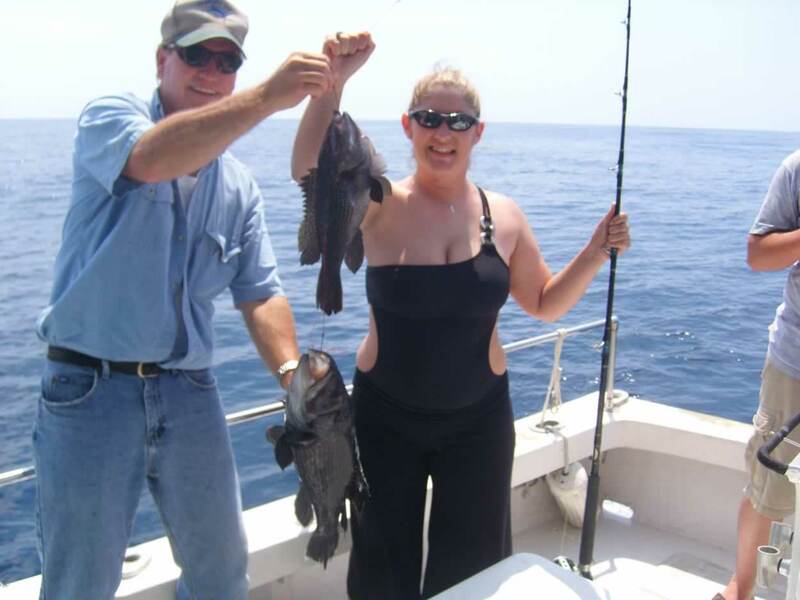 Good Day in the Gulf Stream bottom fishing had limit of Big Sea Bass and trigger fish and Grunts.Nice fish fry for this group. 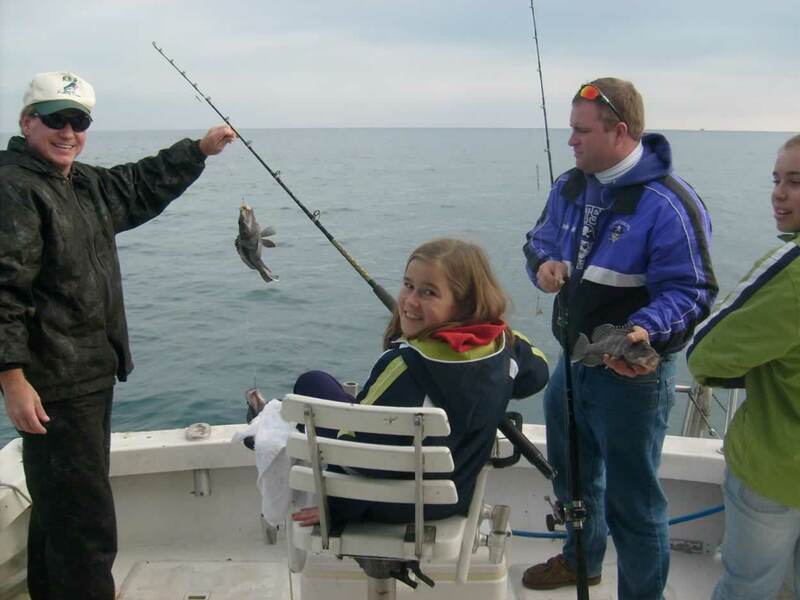 Fish bit good again today inshore on 1/2 day trips alot of Spanish Mackeral and Black Sea Bass.these girls from Wisconsin had a great time on the water today. Good bite on the King Mackeral today fishing on a all day offshore trip with crazy Jim and his employees from Charlotte NC. 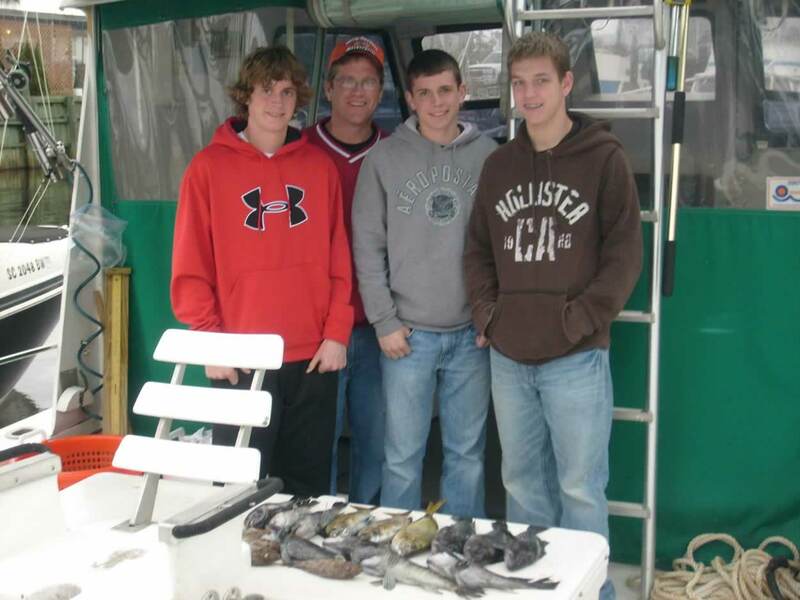 Jim and his group have been fishing with me for the past three years. You might have noticed him in previous pictures with wahoo and dolphins. We had a late start this morning so we didn't go all the way to the gulfstream, but we got some trips next week for dolphin and wahoo if the weather holds up. 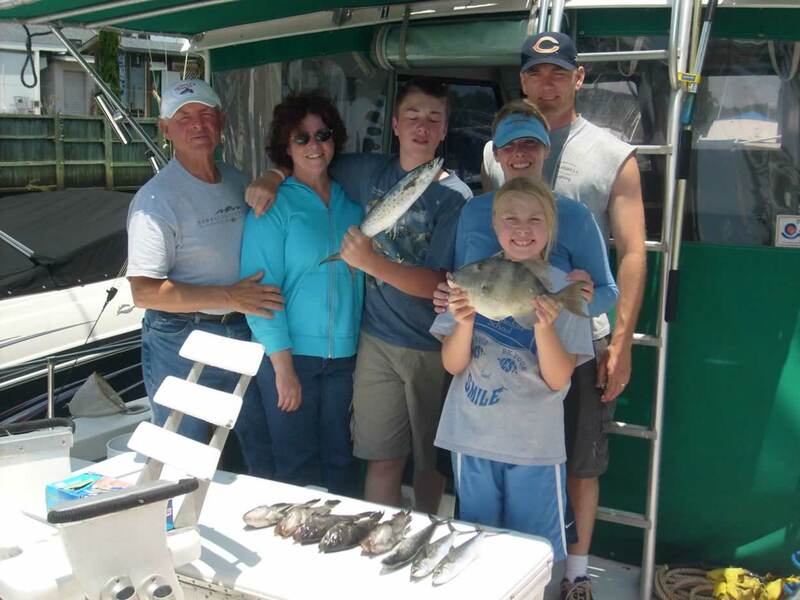 This family from Detroit had a fun time fishing together last Wednesday. 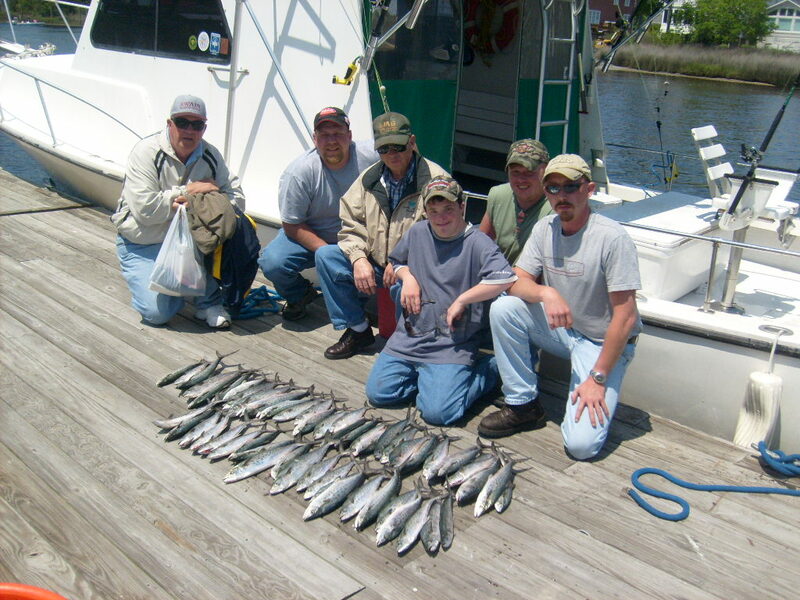 Spanish Mackeral bit good today.This groupe of guys just graduated from collage,they going to have a fish fry tonight. 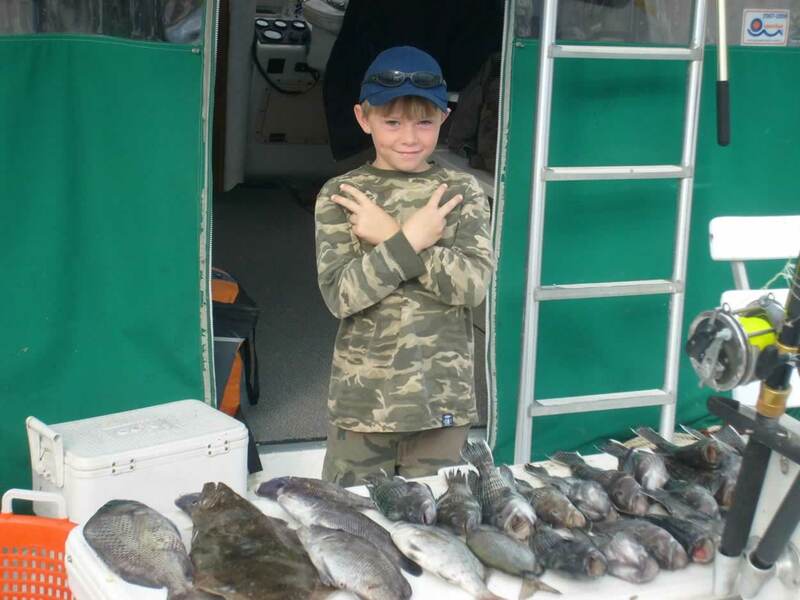 Nice trigger fish caught on this 1/2 day trip.This family had fun on the water today. 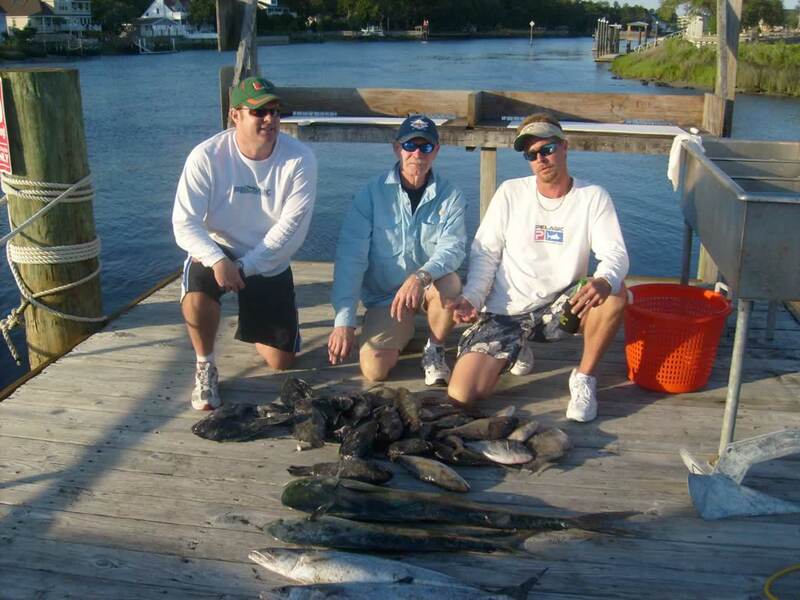 Mahi mahi are biting real good in the gulfstream. Fished with the crew from Anchor Marina in the Dixie Chicken tournament today and came in 3rd place with aggregate weights and 1st place for the biggest king mackeral. We had a good bite but lost 8 fish. 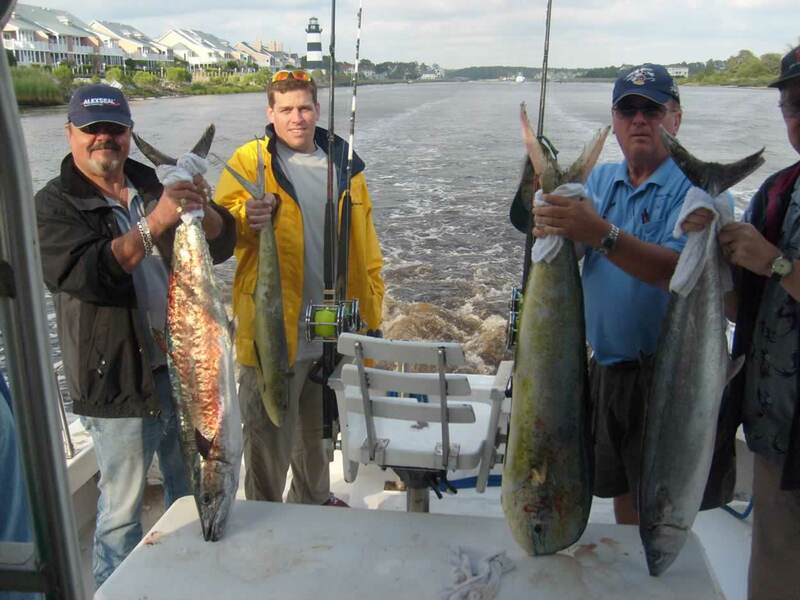 One of those fish was a wahoo. We really needed that one to get 1st place. But anyway, I've fished the tournament four times and always won some money. 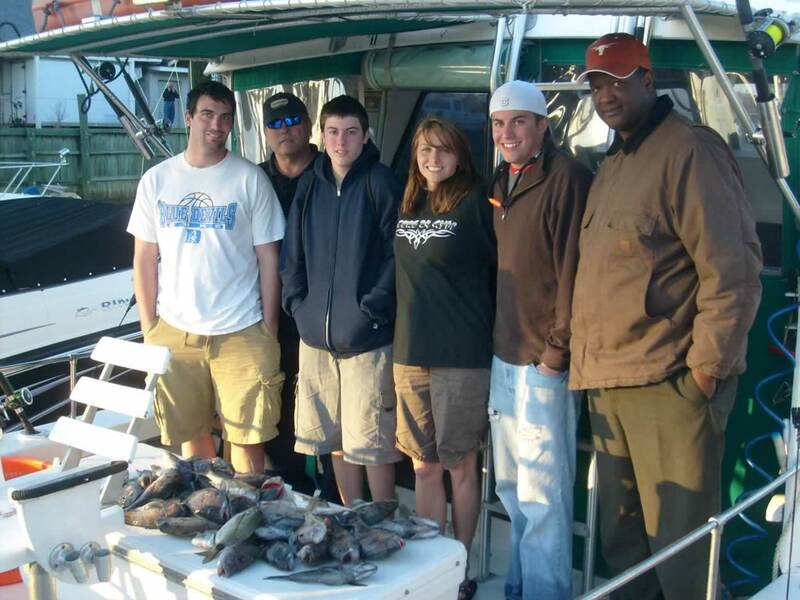 The Offshore fishing is turned wide open now with good catches of dolphin in the Gulf Stream and a few moving in on all day trips. Good trip today this group they only keepted enought to eat,During their vacation time at the beach. 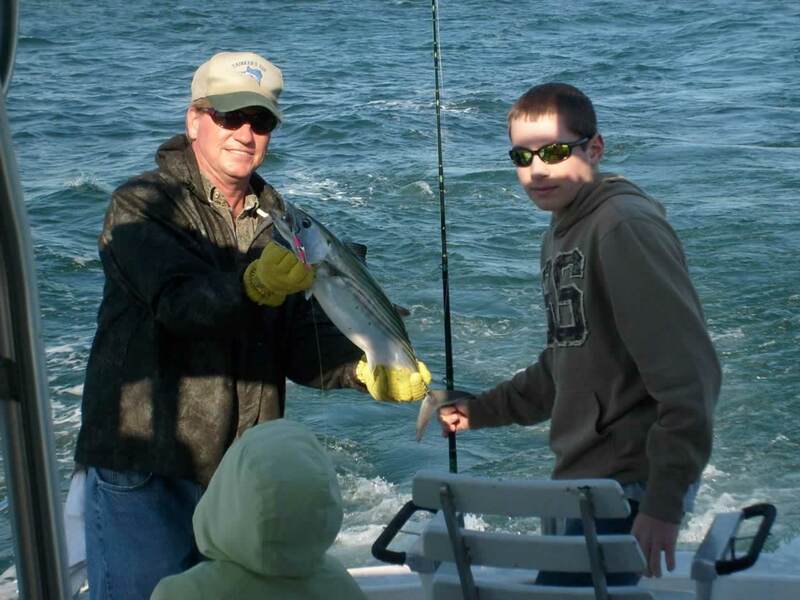 Fishing good in the Gulf Stream for Wahoo and Dolphin.On 1/2 day trips and night trips Before the sun goes down good catches of spanish mackeral and sharkes.Night trips sharkes are bitting strong.